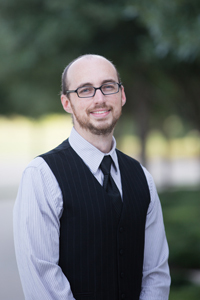 Baylor>Department of Religion>Our Faculty>Faculty>Nicholas R. Werse, Ph.D.
Coming from sunny south Florida, Nicholas has a life-long love for learning and a passion for teaching. When not teaching, he enjoys exploring Texas with his wife Jennifer and son Aiden. Nicholas’s research agenda primarily focuses on the Book of the Twelve and Hebrew prophetic literature. His publication history, however, reveals his extended interests in New Testament literature, Christian History, and Jewish Studies. “The Literary Function of ψευδοπροφήτης in Jeremiah LXX.” Perspectives in Religious Studies. Forthcoming. “Reconsidering the Problematic Tripartite Structure of Zephaniah.” Zeitschrift für die Alttestamentliche Wissenschaft. 130:4 (2018). “Exile, Restoration, and the Question of Postexilic Suffering in Josephus.” Journal for the Study of Judaism. 49 (2018): 1-14. “The Many Faces of the Angel of Death in Rabbinic Thought.” In An Angel Of the Lord Appeared to Them: Essays in Medieval Angelology in the Abrahamic Traditions. Ed. Jun-Ann T. Greeley. Cardiff: University of Wales Press, Forthcoming. “Of Gods and Kings: The Case for Reading ‘Milcom’ in Zephaniah 1:5bβ.” Vetus Testamentum. 68 (2018): 1-9. “Obadiah in the Book of the Twelve.” Coauthored with Anna Sieges. In The Book of the Twelve: Composition, Reception, and Interpretation. Eds. Lena-Sofia Tiemeyer and Jakob Wöhrle. FIOTL/VTSup. Leiden: Brill, Forthcoming. “Death, Resurrection, and the World to Come: Jewish Views on Death and the Afterlife.” Pages 342-355 in The Routledge Handbook of Death and the Afterlife. Ed. Candi K. Cann. New York: Routledge, 2018. “Evangelicals and the Film Fight Club: A Cultural Comparison of Masculine Ideology.” Coauthored with Rebecca W. Poe Hays. The Projector: A Journal on Film, Media, and Culture. 17:2 (2017). “Second Temple Jewish Literary Traditions in 2 Peter.” Catholic Biblical Quarterly. 78 (2016): 111-130. “Crime and Punishment: A Semiotic Analysis of Judgment in Obadiah.” Pages 85-100 in Obadiah. Readings: A New Biblical Commentary. Ed. Bob Becking. Sheffield: Phoenix Press, 2016. “The Student’s Practical Guide to not Losing Your Soul.” Co-authored with B. J. Parker. Pages 129-136 in Graduate Study in the United States: Surviving and Succeeding. Eds. Chris McMaster, Caterina Murphy. New York: Peter Lang, 2016. “An Ugaritic Exorcism Incantation: KTU 1.169. Introduction and Translation.” In Spirit Possession around the World: Possession, Communion, and Demon Expulsion Across Cultures. Ed. Joe Laycock. Santa Barbara, CA: ABC-CLIO, 2015. “Evangelical Fight Clubs and the Power of Religious Metaphor.” Co-authored with Rebecca Whitten Poe Hays and B. J. Parker. Pages 41–54 in God and Popular Culture: A Behind-the-Scenes Look at the Entertainment Industry’s Most Influential Figure. Edited by Stephen Murray and Aimee Upjohn Light. Vol. 2. 2 vols. Santa Barbara, CA: Praeger, 2015. “Historical Criticism among Southern Baptists: A Comparison of Clyde Francisco, Ralph Elliott, and G. Henton Davies.” Baptist History and Heritage. 49:3 (2014): 87-100. “The Preaching Power of Cardinal John Henry Newman.” Practical Theology. 7:2 (2014): 109-124. “Obadiah’s ‘Day of the Lord:’ A Semiotic Reading.” Journal for the Study of the Old Testament. 38:1 (2013): 109-124. “The Theological Fingerprints on the King James Old Testament.” Restoration Quarterly. 54:4 (2012): 229-240.